Of cabbages and kings, and miscreants and probate victims. Everyone is invited to call in and participate. OPG’s, probate attys, GALs, and most of all, probate victims. Come and share your thoughts and your concerns and ways to improve this system. I really do hope that some day the legislatures will pass a law saying the write of habeus corpus is available to disableds who have been isolated and imprisoned in nursing homes against their will and the lower (corrupt) probate courts stand by and do nothing about it. All states should also allow the tort of “loss of consortium between parent and child” when both want to see each other desperately–Gloria is a main case in point. good luck to you. my thoughts and prayers will be with you tonight. Subject: Re: Marti’s Talk show on corruption and how to fix it. yes anyone can and I hope some can post some of the links I have shared on the blog. I will try but mostly will be engaged in the conversation. I am going to try and keep posting my Habeas and the Affidavit of Disqualification because they both have so much documented evidence in both…. You can call in too so please do. Yes I post it. I have to run out for a couple hours…. WONDERFUL. Okay to post? Can anyone join in? Subject: Marti’s Talk show on corruption and how to fix it. I am going to be on Marti’s show tonight. Please join in… If you sign in you can text chat with others. Or you can call in….. We will be talking about probate, collusion and conspiracy largely in the judicial branch. Here is the 10 min video I told you about. It is CRAMMED full of information. Get paper and pencil. this is soooooo good. Take your pick on the bio or combine them…….. I am dealing with the cover up of the death of my Mother then the court system left my Dad with Dementia and mentally impaired incompetent in abuse and literally living like a pig for 6 yrs while I tried to get guardianship which the court refused me. Now the corporate agents have stolen $250,000 from their estate. My Dad is now in a nursing home trying to kill himself so the agents loaded him up on drugs to subdue him which is abuse by chemical restraint. The agents have gutted their home throwing away any final evidence to link the suspect of Mom’s death while it is still an “ongoing” investigation. The Corporate Agents have done everything they can to support the suspect and abuser cause they knew that is where they would make their money. The suspect walks free to this day. This is nothing short of conspiracy and racketeering. Great country we live in. I have had more cases than carters has pills and I can not get any decent legal help with any of this even though we have a Constitution protecting our God endowed unalienable rights. I live in the Twilight Zone of the Outer Limits everyday and wonder why I get up!!! My Mom has no justice for her death and there is still no headstone on her grave. It is bare. Dad has been isolated from all of us and they will steal the balance of their estate and in all plunder a half million dollars. If I had had any viable help to stop this I would have gladly given it to the group who assisted me instead of throwing it into HELL!!!! Mom needs justice and Dad back with me, the estate paid back and these criminal thieves in prison…..Till then we are at war with the Domestic Enemies that is supposed to serve the people. Should a Common Law Grand Jury indict to INVESTIGATE how the government let these crimes proceed? This Writ for Petition of Habeas Corpus to the Ohio Supreme Court outlines the crimes that have been committed on my parents Clair and Ann Miller and petitions to release my 80 year old Dad out of the prison he was abducted and incarcerated into by agents of the Logan County Ohio corporate government. The Ohio Supreme Court denied this Writ therefore they condone murder, abuse of the elderly and theft of THE PEOPLE’S estates. Clair is now chemically restrained after he tried to commit suicide documented in the Habeas Corpus. Clair does NOT NEED TO BE HERE. He should be home with Rosanna and family. All the LAWS, LEGAL DOCUMENTS and PROFESSIONAL CREDENTIALS were in place to stop this but the AGENTS of the government just ignored it all. Clair and Ann’s Estate at her death. Thief Lawyer Fansler inventory submitted January 2013 only after it was demanded. OHIO SUPREME COURT THROWS OUT THE MAXIMS OF LAW!!!! Ann has no justice for her death or headstone on her grave! Clair has been abused by agents of the government who have aided the suspect and abuser! There is $250,000 plundered from their estate! The government had a duty and responsibility to stop this. They knew it was happening all the way up to the State Level and did NOTHING. Now why would they let it proceed on? How many hands is the stolen money in??????? Thanks Marti for what you do. See below, it says it all…. This communication regarding a probate hearing held June 25, Room 1804 Daley Center, Chicago IL at 2 pm, Judge Jane Stuart presiding will be quite extensive, therefore I am beginning with a summary. 8) Promulgation of an order which is unconscionable, legally, morally or in justice. Ms. Gloria Sykes provided Judge Stuart and all the known other parties mentioned a motion on June 24, 2013, including exhibits of recently received information on the NON-EXISTENCE of jurisdictional notices including a possible window warrant on Mary Sykes at any point before she came under the custody of Mrs. C. Toerpe, or before any guardianship actions were undertaken. Even while in the custody of Mrs. Toerpe, after the fact, records do not exist in the office of Tom Dart, Sheriff of Cook County, showing an executed summons. A letter signed by Sheriff Dart, along with a copy of records attests to this fact. Without an executed summons, or executed window warrant, no jurisdiction ever existed over the person or property of Mrs. Mary Sykes. Without regard to this fact, which was added to other non-service of warrants on other persons required to be served – and denials by Ms. Gloria Sykes that her mother was ever served in any manner according to law, Judge Stuart proceeded with hearings which existed under color of law, but without authority. To me it seems quite clear that Peter Schmiedel, who provided a copy of the so called summons which he stated would definitively show that jurisdiction in this case existed, has NEVER IN HIS LIFE done such a plebian thing as actually start a service, follow it through with the appropriate clerks and sheriff deputies, and ensure that all “i’s” were dotted and every “t” crossed. First of all, there are special sections in the Statute governing the elderly and other wards of the State requiring a special service form to be used. The form which Mr. Schmiedel so proudly presented was a garden variety service form. The statutory form has something like eleven protections which are to appear in LARGE FONT BOLD PRINT: things like “you are entitled to a jury of six persons” , “you are entitled to an attorney of your choice”, etc. etc. Apparently, an attorney who needs to provide service to a citizen must first pay a fee of $50.00 to a clerk. The clerk then stamps the form in two places. In one place, the financial details of the payment are provided. In another place, there are stamped blanks where the name of the person to be served is filled in. Interestingly, the last name appears in a different handwriting and a different thickness of pen than the first name and middle initial of Mrs. Mary Sykes name. There is also an illegible signature followed by a badge number, also, interestingly, in the same different nib size. It is the next step which is crucial. This particular document is supposed to be something called a window warrant. Evidently the person at the Sheriff’s office takes the receipt to a different clerk OR officer. The warrant is then supposed to be handed to a sheriff’s deputy who hands it to the end recipient, stamps the receipt with a BATES NUMBER (so that it can be cross-referenced in the Sheriff’s Files), and signs, UNDER OATH, on the line provided, after the recipient has received his or her copy or on his or her copy. Cook County Sheriff Tom Dart, on his letterhead, with his signature, has provided a copy of all records pertaining to Mrs. Mary Sykes. They show the failed service known about by all prior to May 5, 2013, to the address of Mrs. Mary Sykes: it failed, because Mrs. Carolyn Toerpe had ALREADY removed the unwilling Mrs. Mary Sykes out of Cook County to her own house in Du Page County BEFORE ANY SERVICE AT ALL HAD BEEN ATTEMPTED. It was not until May 5, 2013, that a friend of Ms. Gloria Sykes took it upon herself to go to the Office of the Sheriff of Cook County to look up the record, and found, to her surprise, that there was no record of window warrant service. Thereafter, another friend wrote to the Sheriff, requesting the history of all records, and it was a copy of the reply letter, received the week of June 17 which was delivered to all the known attorneys and to Judge Stewart on Monday June 24, 2013. This effort was ignored by Judge Stuart. I am a lay person, a retired chemistry teacher. I have recently read Wolf Hall, and believe that even Henry VIII had some sort of sheriff’s service procedure. The Illinois Statute, which I have read, provides that the Sheriff shall serve a copy of the petition for guardianship, a summons or notice in bold face, as described above, AND service to ALL near relatives such as Mrs. Mary Sykes surviving two younger sisters, and to both daughters. The server has to acknowledge that he gave the proposed ward the summons, the appropriate warnings in the appropriate print, and a copy of the petition, in a sworn or certified return. Also missing was any indication that Mrs. Sykes near relatives had any notice or knowledge whatsoever prior to any hearing, particularly not the specified full fourteen days of notice. The document provided by Mr. Schmiedel did not accord in any way with the requirements of the Statute. It is the first duty of a judge in ANY proceeding to determine that jurisdiction has been attained, and that determination is procedurally determined and not a matter of individual judgment, speculation or preference. I have seen a plethora of case law on the subject as well; this is not something arcane, mysterious or little known!!! Judge Stuart ignored the right of all parties to a hearing to be present at all consultations involving the litigants. In full view of the court, she denied Ms. Sykes, a pro se litigant, the right to be present at the bar while she spoke privately to the lawyers and plenary guardian listed above. This meets any definition of ex parte proceeding that I, a non-lawyer, have ever been able to find. While Ms. Sykes is barred from representing anyone else, she stands as her own lawyer in these proceedings ; she is a de facto lawyer for herself and has been unjustifiably excluded. his appearance was possible. They, and the plenary guardian, Mrs. Carolyn Toerpe, were accorded every courtesy. HOWEVER, had a member of the bar been representing Ms. Gloria Sykes, he would have been peppering each of the attorneys with “Objection: foundation”, “Objection: relevance”, “Objection: hearsay” and various other objections which as terms of art summarize whole bodies of legal principles. Therefore, the pro se litigant is extended lenience to use common terms which sometimes need explanation. It was rare that Judge Stuart extended the courtesy even of stating “objection overruled” or “objection sustained” or “objection taken under consideration”. Instead she snapped, a la Judge Judy, “I did not call on you”; “Wait your turn”; or simply ignored Ms. Sykes’ protests as to the FACTUALITY of the allegations of the attorneys. She did put Mrs. Toerpe under oath at one point; however, Ms. Sykes was not allowed to question Mrs. Toerpe directly. When, however, it was Mrs. Sykes turn to speak, after at least an hour of unhindered testimony by the four attorneys and the plenary guardian, possibly much more, Judge Stuart gave her a few unhindered minutes, then started directly questioning Peter Schmiedel and others, and eventually ordered Ms. Sykes to sit down before she had had any chance to make her full case. Personal Property: Personal property is generally of less value than real property. Nevertheless, the duties of the Plenary Guardian include most particularly preserving the financial value of personal property and preserving the emotional health of the ward. In order to preserve the financial value of personal property, particularly in the event of a sale, that property must be kept under proper conditions, must be appraised by a certified appraiser, an inventory must be kept, and a record kept of any proceeds of any sales. Mrs. Mary Sykes was the recipient of a police widow’s pension, was covered by a Blue Cross Blue Shield policy, and while living independently was able to cover her needs without recourse to selling her personal property. I am not aware of the particulars of her financial situation, but I do know that she lived the life of a typical far northwest side of Chicago matron in one of the city’s most prosperous neighborhoods, actively participating in her garden club, local politics (particularly involving public or semi-public gardens in the area), and her church. All of these activities involve luncheons, and other luxuries, including the yearly replenishment of her own gardens and the hiring of gardening personnel. In no way can it be believed that she lived, on her own, a life of poverty. Since all of her sources of income were still available to her, and her share of the household electricity and gas was less than one third to one fourth of the household expenses (she was presumably not cooking independent of the family or consuming single serving prepared foods) and she was not given the freedom to use her drivers’ license, so she was not using gasoline, or shopping for clothes for luncheons, or paying extra for charity luncheons, it is not clear why living in her daughter’s house consumed her income so severely that it was necessary for her personal property to be sold at all. Under oath, Mrs. Toerpe testified that she moved Mrs. Mary Sykes furniture first to a storage facility (the first month is usually free or one dollar), and then she moved the furniture to her personal garage, from which it was necessary to have a garage sale, in full view, no doubt, of this Mother she so “treasured”. One can only guess at the emotional impact on Mrs. Mary Sykes of seeing her antique furniture, upholstered in silk and covered with plastic probably for forty or fifty years, and her Waterford Glass, dumped into a garage and then out onto the driveway, for a garage sale… the leftovers, as Mrs. Toerpe testified, donated to her Mother’s ’favorite charity’, Goodwill and the Salvation Army. If this furniture bazaar was necessitated by the sale of the house (which will be covered next), it is typical in a neighborhood like Norwood Park for a House or Estate Sale to be held. This would at least have spared Mrs. Sykes the emotional agony and pitiful sight of seeing her belongings treated so cavalierly!!!! The purpose of the Guardians ad Litem is to protect the interest of the ward against the possible conflict of interest between the plenary guardian and the ward, but it was Ms. Gloria Sykes who provided the description of the silk upholstered furniture and the Waterford crystal, and who would have detailed the collectibles etc. so disdained by Mrs. Toerpe had her time allotment been fairly treated. (The printed information about the personal property was given to Ms. Sykes by the Judge, who allotted her seven minutes to decide what to do with it!) Ms. Gloria Sykes had properly serviced the four attorneys, the judge, and the plenary guardian with information and had receipts showing that the documents she had prepared had been delivered; nevertheless, the abovementioned people had not bothered to look at their deliveries and were handed extra copies and as much time as they cared to take to deal with this material at the start of the hearing. Frankly, it is I, a North Side “matron” who have provided the description of the way of life of my neighbors in a nearby area , even those twenty years older than myself! REAL PROPERTY: the plenary guardian in seeking this job represented that she would protect the real property of her ward. Yet, under oath, she testified that she produced twelve months or more of checks at a time and never bothered to consult the invoices the bank sent for the mortgage on the house. Predictably, with checks sent which were much smaller than the cost of the mortgage for months on end, and with the Plenary Guardian ignoring any communications from the bank, the house ended up in foreclosure. Although Mrs. Toerpe under oath claimed that she took action to take the house out of bankruptcy, Ms. Sykes, before she was forcibly silenced by Judge Stuart claimed that in fact she had taken said action. In any case, due to Mrs. Toerpe’s dereliction of duty, Bank of America foreclosed on the house, and Mrs. Toerpe detailed the fines, penalties and increased interest she was forced to pay to redeem the house. Mrs. Toerpe did NOT detail the costs of the attorneys, hearings, filing fees and the like which she also must have entailed by her heedless and irresponsible behavior. The Guardians ad Litem took NO AFFIRMATIVE ACTION to forestall this wasteful and deleterious behavior. There was controversy, again, upon the conflicting allegations of the sisters, as to who paid for the ADT security system and even where its control box was located, and which floors were protected! Judge Stuart’s reaction was gently to admonish the Guardians ad litem “going forward” to speak to their client and encourage her to do her fiduciary duty. She, above all, had the obligation to see that the Guardians ad Litem performed their civic obligations in their appointed positions before the waste of property had occurred, since she clearly acts as if she in fact had and has jurisdiction over the person of Mrs. Mary Sykes. I am horrified at her callous indifference to the duty of the plenary guardians, the guardians ad litem, and her own sworn duties to uphold the Law of the State of Illinois as it refers to the real and personal property of a so-called “ward of the state”. Judge Stuart told her that she had commingled funds, since she had paid herself without a court order, and should never do such a bad thing again, and counseled the Guardians ad Litem that “going forward” they should explain this to their backward client. (All assets have been dissipated; ‘going forward’ is meaningless.) Why was this alone not enough to terminate her guardianship, if not to bring criminal charges is enough of a mystery to me to have caused me to spend hours writing this communication to you. Where was the protection the Guardians ad Litem were supposed to be providing their ward? They are attorneys expected to know the law of the land. I believe that their malpractice is also actionable. De Novo, the guardians ad litem introduced the actions of Ms. Gloria Sykes in, having determined the location of her mother’s new domicile on the hunch that her mother’s presence in her sisters’ home would no longer be necessary since she no longer possessed any tangible assets of monetary value, and therefore would be removed to a nursing home where she might soon die. Unfortunately for them, there is a statute ensuring that persons living in sheltered care facilities may not be isolated from family or friends. Ms. Sykes determined that her mother, Mrs. Mary Sykes, was living at the Sunrise Center, called the center in advance, and spoke with the nurse who told Mrs. Mary Sykes that her daughter was calling. Mrs. Mary Sykes first determined, by asking the nurse, that it was Ms. Gloria Sykes who was calling. She does have hearing aids but was unable to hear Ms. Sykes voice over the phone, but she was heard telling the nurse to tell Ms. Gloria Sykes to come to Sunrise Center immediately. Ms. Sykes decided to bring two friends with her; I was not invited. I heard from Ms. Sykes before the visit and from one of the friends and Ms. Sykes immediately after the visit. It has been my experience, visiting friends at rehab centers after hip surgery, and also at the Alden Home in Lakeview and at Self Help (also in Lakeview) visiting a sick colleague for whom I had been informally named a Patient Advocate, that often ID is required and that sign in is always required. These patients were in full control of their own persons and property. Therefore I am certain that Ms. Gloria Sykes and friends were required to sign into the Sunrise Center. Their report was that Mrs. Mary Sykes immediately recognized her daughter Ms. Gloria Sykes, and clung to her with hugs and kisses. The short visit was extended to forty-five minutes to an hour, depending on the reporter (including Mr. Stern), because Mrs. Mary Sykes would not relinquish her daughter. When Mrs. Carolyn Toerpe arrived on the scene, Mrs. Mary Sykes is reported to have said, “Good. Now I have my two daughters together. There are some things we have to discuss.” At that point, Mrs. Carolyn Toerpe lunged at her younger sister, but was prevented from a full blown battery by the intervention of the male friend who had accompanied Ms. Gloria Sykes. Ms. Sykes was able to escape injury. Then Mrs. Carolyn Toerpe is reported to have grabbed her mother forcibly by the arm and dragged to a room which she then locked. By any measure, this is elder abuse, assault and battery. As she was being dragged away, I was told that Mrs. Mary Sykes asked Mrs. Carolyn Toerpe when she would next see her younger daughter Gloria. Mrs. Toerpe’s answer is reported to have been “Never”. In some manner, Mr. Stern became aware of the presence of Ms. Gloria Sykes and her friends at the Sunrise center and is said to have falsely reported that Ms. Gloria Sykes had caused a commotion. I have been told that Mr. Stern was not even on the premises when this call was made. HOWEVER, other persons were on the premises. There is a record of the arrival of Ms. Gloria Sykes and her friends and of Mrs. Carolyn Toerpe in their own handwriting with a time listed in any sheltered care facility. This personal knowledge on my part is necessary to detail the extreme horror of what ensued in the Courtroom of Judge Jane Stuart. Mr. Stern told his version of the story. Ms. Sykes had been ordered to sit down next to me, and the bailiff had been enlisted, although at most she had given Ms. Sykes a gentle touch on the shoulder. Ms. Gloria Sykes tried, from the pew on which we were sitting, to protest and object to the factuality of the fable Mr. Stern had concocted. This gave Judge Stuart an opportunity to show what a humane and justice upholding individual she was, while she castigated Ms. Gloria Sykes, without ever asking Ms. Sykes for her version of the story . The transcript will show the exact words Judge Stuart used. Any judicial temperament would have required that Ms. Sykes be treated as innocent until proven guilty. Mr. Stern used the action taken by the police at his behest to “prove” the bad actions of Ms. Gloria Sykes, but in fact, after one half hour, the police released Ms. Sykes and her friends from their custody, as there was no court order, as had been alleged by Mr. Stern, and no reason for their detention. Mr. Stern, as a Guardian ad Litem is an Officer of the Court and he misused his position to mislead Judge Stuart and to make statements that were not provable, in light of the fact that he was not even on site to determine for himself what had occurred. Had Judge Stuart performed her judicial office, making inquiry of Ms. Sykes and the two friends who were actually present and available to testify in the court room at that time, she would have easily determined that at the very minimum, there were contested versions of the activity which occurred once Mrs. Carolyn Toerpe appeared on the scene. Judge Stuart then entered an order which is patently improper, as it bars all visitors from taking pictures, limiting the subjects visitors can talk about when visiting Mrs. Sykes (as a mother, I would know intuitively if my adult children were choosing their words in order to avoid certain subjects and this would trouble me deeply) and visiting Mrs. Mary Sykes without the written permission of Carolyn Toerpe, on the basis of the unverified and unwitnessed accusations of Mr. Stern. In fact, on Monday, June 24, 2013, I have been told, the two elderly sisters (in their mid eighties) had left the north side of Chicago to visit their beloved sister in Naperville, and had been barred from this visitation upon arrival. (This is a distance of at least thirty miles, possibly more). The order entered is, to my lay eyes, a travesty and worthy of the removal of the judge from the bench. I have attached a copy of the order to this letter and request you to compare it with the applicable statutes prohibiting isolation of seniors. In this case, TWO SENIORS, not just one, were isolated from contact with their third nearest relative, also a senior, making a total of three isolations. This delegates the judicial function to Mrs. Troepe with regard to ALL visitation, effectively isolating Mrs. Sykes emotionally and in all other aspects from the world in derogation of statute and case law, basic human rights, the Constitutions of the United States and Illinois. In addition on June 25, the date of the order, sworn evidence was taken of Mrs. Carolyn Toerpe that she subjected her mother to the unnecessary emotional abuse of a garage sale of her coveted personal property in her presence (Mrs. Mary Sykes lived in the Toerpe house). Additionally Judge Stuart stated that Mrs. Carolyn Toerpe commingled funds. She promulgated the most draconian of the orders on the basis of an unverified and uninvestigated statement by an party who was appointed to be the Guardian of Mrs. Mary Sykes’ interests as opposed to the interest of the Plenary Guardian, without investigation. The order was issued ON THE DAY that said Guardian ad Litem had by commission and omission been shown to have failed utterly in that task. For example, the unnecessary bankruptcy proceeding took place because Mr. Stern did not properly supervise the amateurish efforts of the plenary guardian, who claims to be a Ph.D, in paying the bills. The City of Naperville maintains its police department to enforce its laws and to maintain order. The police force was summoned by a non-witness to harass innocent people, legally making a peaceful visit to their relative and dear friend. The patent impropriety of the enclosed order speaks for itself. It is a delegation of the functions of the Court in guardianship proceedings, to a Plenary Guardian who, in these very proceedings has been accused through the word “commingling” by the Judge, of serious and actionable misconduct, and abandonment of her fiduciary responsibility by her own testimony. The first order of an American Court is to provide equality through the administration of justice which is blind as to persons. The blindness in this case is to the misfeasance, malfeasance, and provability of facts — including not only the actions and inactions of the two guardians ad Litem and the plenary guardian, and the attorney for Mrs. Toerpe, who cannot even recognize a defective document in time to avoid sending a copy of it to a person who does recognize its lack of value, but also the judge, who, in not immediately ascertaining the lack of jurisdiction she and her predecessor in this case have had to take control of the life of Mrs. Mary Sykes, a feisty woman who at 94 ½ still recognizes both her daughters, greets them appropriately, and can form a plan as to her own future, has caused immeasurable suffering to Mrs. Sykes, Mrs. Sykes’ sisters, and Mrs. Sykes younger daughter, continued this travesty of justice. The order of June 25, 2013, attached, all by itself, are an indictment of the Judge and the appointees in this case. Inquiry Committee has available to determine the incredible behaviors of persons who should be above reproach on only this one day of nearly four years of litigation. The examples will multiply exponentially if even a few more hearing dates are investigated, according to what I have been told. I am confident that justice will eventually be obtained for Mrs. Mary Sykes, her younger sisters (elderly seniors also abused by these proceedings, as they have been denied the solace, companionship and comfort of the older sister who essentially raised them,) and her younger daughter, Ms. Gloria Sykes. Judge Stuart has abdicated her responsibility to apply even handed blind justice and has become a fifth advocate for Mrs. Carolyn Toerpe. On the basis of the actions I personally saw, the documents I have personally seen, and the lack of investigation of brutally untrue allegations falsely made by an officer of the court under her supervision, I believe Judge Jane Stuart to be unfit for the bench. I recommend that she be removed, certainly from this case, and quite possibly from other not yet reported cases in which she may have made similar transgressions. Unfortunately this attached order (the order states Carolyn Toerpe, a known abuser, must provide written permission to all visitors at the Sunrise Nursing home), see the orders from July 25, 2013 posted elsewhere on the blog) is not unique and the miscreants who polluted American jurisprudence with their attornment are not unique, but part of a growing number of amoral people who have law degrees that they are using to exploit and abuse senior citizens, the disabled and those that our society elected to protect. the cancer is metastatic and the media, law enforcement, the legal profession and Americans in general have in the past celebrated their liberty by being complacent. Parens Patrie is dead! Please read the order attached in perspective. Then if you love the freedom and culture America represents FREE MARY SYKES and those elders who are similarly situated. Reject Buck vs. Bell being applied to your grandmother, grandfather and other seniors! I received an e-mail from Gloria Sykes today that she tried to contact her mother by telephone. As expected the attached order was effective to thwart any contact with Mary Sykes and in particular contact with the younger daughter. It should be noted that Adam Stern is reported to have attempted to bribe the two siblings with visitation if they become estranged from Gloria and her efforts to obtain an investigation of the continued isolation of Mary. These Taliban tactics as well as the attached order are the credo to cottage industry that preys on the most vulnerable our senior citizens and denies them of their liberty and property. Senator Kirk and General Holder – we need you help now while Mary Sykes still has life! I’ve copied the Sheriff of DuPage County and Tom Kammererer of the Naperville Police Department as I am requesting wellness checks on Mary Sykes. I do not want Mary to suffer the same fate as Rudy Bush’s mother! I’ve attached a copy of the horrific order that Judge Stuart entered to remind everyone of the type of amoral people helpless and vulnerable senior citizens are facing. Senator Kirk – you suffered a stroke! I am a cancer survivor a bit long in the tooth. Had I not had a a cadre of activist friends, and had you not been a United States Senator we and our potentially vulnerable families could have had an Adam Stern, Cynthia Farenga, Peter Schmiedel in our future! Judge Stuart could have entered a similar order to keep us isolated while we were deprived of our liberty and *****. This is a crisis for the vulnerable! The vulnerable senior citizens need help! Read the attached order! This is not NORTH KOREA – A Judge in the United States of America signed her name to the death warrant order for Mary Sykes. God Help us! The letter that Judy wrote is already in the public domain and therefore you are free to use it as you wish. The order entered by Judge Stuart on June25, 2013 qualifies as the most horrible and venal order I’ve ever read or had contact with in my fifty plus years of practice of law. The Supreme Court in it icon case of Near vs. Minnesota pointed out that prior restraint on free speech was absolutely prohibited, yet, Stuart had no problem with it as she illegally delegated the authority that the Illinois legislature delegated to her in 755 ILCS 5/11a – 17 and 5/lla – 18. Dear Judy may I please forward to the Judiciary Inquiry Board with my final complaint on Judge Stuart? Also it would be most appreciative if Margaret could also write a bystanders report. Public opinion outlining the facts as you have so professionally and honestly must and should turn heads. I am going. To DC on *** and would like to hand deliver to **** as well as will. E meeting with east coast publishers and national media. My mother has been overtly kidnapped by a private company that is publicly traded. The dept. if health gave it a pass based on affudavits from unknown employees who claim that my complaints were unsubstantiated: another words Carolyn Toerpe did not strike and shove senior Doris Evans and overtly physically and verbally abuse my mother telling her that she’d NEVER see me again when mother asked when I’d return to visit. I’ve sent your letter on to JoAnne. I agree with it 100% I’ve also forwarded it to law enforcement based upon the now total isolation of Mary Sykes once again. Subject: Fwd: Here it is. Subject: Fwd: Fwd: Here it is. Here you can see some of the many probate blog workers informing the public on how probate is not a place to go without a lot of research and information. Perhaps it’s time to republish the Mike Kellerman report from Press TV from two years ago…. it’s the same story and the congress people and senators we met with who promised to help, have yet to help. at least it’s a good honest story. One thing not mentioned in the story is how it is typical for a OPG or Plenary Guardian to grab hold of an estate, place a disabled in an expensive nursing home. Rack up attys fees from a Guardian ad Litem and a probate attorney for the Plenary Guardian, and fees for social workers, evaluators and other personnel, and over a very few years a paid up home and bank account can be drained $300,000 to $500,000 and then the elder is left indigent, and often in low quality nursing homes, or downright dangerous ones, or even on the street in rooming houses, eating out of soup kitchens. True stories abound. As the population ages, they need to be aware this is not a good tactic for anyone. But good job, GJS, Tim Lahrman and others who did this video in front of the Dept. of Justice a while back. Yeah, the result of CT grabbing Mary’s hand until she cried out in pain, is that SHE determines in writing who gets to see Mary and who doesn’t. As you can see from the four pages and two orders the real focus on the orders was and is to keep Mary from having visitors and keeping her isolated. When the transcript is available it will be spread on-line for the world to see. The disguising spectacle that was exhibited on June 25, 2013 in the Daley Center is just one of many that have been observed in the Mary Sykes case. Unfortunately every day there are dozens of similar performances occurring across the land and victim after victim cries out for help to deaf ears. Families of victims cry out to even deafer ears! The two orders entered by Judge Stuart (which have been posted and circulated) are so obscene as to shock the conscience of a Nazi storm trooper! The plenary guardian has a history of misconduct and exhibited it a day before when she was observed and reported to have allegedly assaulted not only Mary, but Scott Evans and Gloria Sykes. The by-standers reported the plenary guardian forcibly interfering with peaceful visitation by dragging with Mary Sykes with great force away from the premises so as to interrupt the visitation. Previously, the plenary guardian was reported to have injured Mary’s elderly sister by another act of violence. As Human beings – how can any of us sleep at night and no cry out in agony when we see an elderly woman treated so inhumanly? It is terrible when a human being is trapped in his/her body by a medical accident = such as stroke and we cannot help. But here we as human beings are watching a bunch of miscreants ‘trap’ Mary Sykes in a nursing home or other facility and isolate her from friends, family, and her activities. This is a threat! Every one of us is vulnerable. What has happened to Mary Sykes could happen to you. If you look at the videos of Mary Sykes in 2009 she appears and was a functioning adult. She went to the Bank, made deposits and even noticed when the person who is now the plenary guardian removed without permission funds from the bank account. Mary was functioning almost as well as you! She tried to do something about a series of alleged thefts by the person who became her plenary guardian and the rest is history. My grandfather used to tell the story of a man in Russia who was very successful and bragged that he might die of many things but he would never starve to death. On day as the man entered his vault, a gust of wind blew the door shut! Days later when they noticed he was missing someone broke into the vault he was dead – he died of starvation! The first question that law enforcement, the ACLU, your senator et al asks is: ” I do not want to get involved in isolated cases – do you know of any other cases.” Translated – go away! The GAO report to Congress is almost word for word what the article relates, but her we sit and watch Mary Sykes and other seniors being victimized by Farenga, Stern, Schmiedel et al. We watch you (Janet) forced into exile – afraid to return to her home. We watch any attorney who opens his mouth in protest having to fight for his/her license as the IARDC (and similar organizations) think it unethical for attorneys to speak out against elder cleansing! From the reaction of government to ‘elder cleansing’ you would think that it and ethic cleansing are laudable occupations and attorneys who spoke out were deviants! I wonder if the State of Illinois licenses ‘elder cleaners?’ If they took as a license 10% of the profits there would be over $100,000 + from Sykes (could be as much as $1,000,000+ if many of the coins were uncirculated and the real estate is included, $150,000 from Gore, $800,000 from Tyler etc etc. You’ve spent your life building up some assets and you think they are secure. Or you got an inheritance and you think it’s yours. Where there is money, there are vultures ready to steal it. Among the most dangerous vultures are Public Guardians and conservators, who are willing to lock you away to steal your money. Judges simply look the other way and give them carte blanche to do as they please with your life, your property and your future. With a stroke of the pen and the elimination of one dangerous government office, Jerry Brown could save the people of California, hundreds of millions of dollars and protect the state’s seniors, their heirs and their assets. In Orange County, California, we have had a changing of the guard. That’s because John Williams, the last Public Guardian and Peggy Buff, his second in command, lost their positions after they got caught ripping off Orange County residents. Since Peggy Buff was the District Attorney’s fiancée, seniors were powerless to protect themselves. Williams apparently thought his sole responsibility was to grab the assets of senior citizens to help with his department’s budget shortfall. When this was exposed, the public thought they could do better. Williams already had been twice dinged by the Grand Jury for mismanagement of funds when the truth hit the media big time. For years, Williams had been confiscating assets from rich Orange County citizens whom he felt could not handle their own money. While he grabbed their estates, these seniors were often put into low-cost sub-human facilities, places that mostly facilitated early deaths. Sometimes seniors were not even properly notified that Williams had secretly put them into conservatorships and had ripped off their assets until their associates were arrested for kidnapping for just taking them to a nearby fast food restaurant. Adult Protective Services was reportedly in on the get-rich-quick scheme too. When APS comes calling, the Public Guardian isn’t far behind. It’s all about money. Williams met his downfall after hinting he planned to grab the assets of a Santa Ana woman, a forty-year civil servant, whose family had rescued her from a violent abuser. Williams, Adult Protective Services and the District Attorney’s office made no attempt to go after the violent abuser. They didn’t care about protecting the elderly. They just wanted their money. Deputy District Attorney Todd Spitzer made an inquiry call about the matter to the Public Guardian’s office, putting the money-grabbers into fear that he was wise to the scheme. So District Attorney Tony Rackauckas fired Spitzer and told him the reason for the termination was the inquiry call about the matter of the Santa Ana woman. Needless to say, there was a press conference and the truth came out. More and more of the Guardian’s victims flocked to the press with some pretty disturbing horror stories. In the end, Williams was not able to keep his position, and was locked out of his office. However, recent reports do indicate that the changing of the guard may have just been a superficial fix, window dressing for a corrupt system that continues to threaten the security of Orange County’s seniors. In San Bernardino County, the Public Guardian is picking people up off the street and warehousing them. I attended a Yucaipa town hall meeting a while back where citizens who expressed concerns about the disappearances and spoke about their fears regarding what had happened to those who hadn’t resurfaced. Occasionally, the Public Guardian hits the jackpot by nabbing someone with enough money to assist with the office’s budgetary desires. Often these individuals wind up dead, like Charlie Castle. He didn’t just wind up dead. He was held for over a year against his will by the San Bernardino Public Guardian before his death. Here is a Facebook page that was started by people who were worried about him. Then there is the Riverside County Public Guardian. International journalist and popular author Janet Phelan is trying to get some answers regarding the depletion of her mother’s trust fund. The Riverside Public Guardian Bill Vanderpoorten seems to be hiding out. He won’t answer phone calls or see members of the press at his office. The Public Guardian is paid by the public but apparently doesn’t answer to the public and doesn’t want anything to do with the public – unless maybe it’s grabbing their money. Their operations are hush hush – kind of like the operations of drug dealers, hitmen, etc. – you know, the people who have to operate in secret because they’re likely to be arrested if the public knows what they are really doing…. Among the questionable acts the Riverside Public Guardian is alleged to have committed in the Amalie Phelan Trust are the improper depletion of trust assets in violation of the trust document and the law, an uneven distribution of trust assets in violation of the trust document and the law, the pawning off of taxes on one of the beneficiaries in violation of the trust document and the law, and falsification of documents, interstate mail fraud and misstatement of wire transfer fees, all in apparent violation of the trust document and the law. Among the issues are false charges to Ms. Phelan’s account for a wire transfer from the brokerage of UBS. Though UBS charged in-country transfer fees, Attorney Toni Eggebraaten on behalf of the Riverside Public Guardian’s office pretended that the fees were out-of country and charged double. Apparently, somebody in her office or that of the Public Guardian pocketed the rest of the overcharged fees. If the Public Guardian’s office were operating in accordance with the law, they’d have nothing to hide. But they seemed pretty frightened of public scrutiny the day I showed up. I had left numerous messages for Public Guardian Bill Vanderpoorten with no response before showing up at his office. In a booth was a woman who identified herself as Sharon but who didn’t have a last name or at least not one she would give out. She spoke over a phone to a supervisor who reportedly told her to tell me that nobody in the office would speak with the press. However, that supervisor’s name was top secret and Sharon stated that she could not provide any part of the supervisor’s name. So this person who refused a media request didn’t even have a first name. 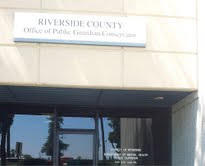 Since the only identifiable people working for the Riverside Public Guardian’s office are Bill Vanderpoorten and Sharon No-Last-Name, then theoretically that office should only receiving funding for one and a half salaries. If more has been paid, a refund should be demanded. This writer was referred to the above-mentioned outside attorneyToni Eggebraaten, who (like Bill Vanderpoorten) does not return phone calls and who was reportedly involved in much of the above-mentioned wrongdoing. Janet’s grievances with the system run much deeper than just the above issues. The Riverside Public Guardian’s office and the case are connected to Melodie Scott, the former conservator for Amalie Phelan. Melodie Scott has a particularly troublesome problem. It seems her wards too often drop dead, prematurely. Maybe conservatorships are not so healthy. Hint. Hint. If you want a long life and someone wants a conservatorship over you. Run. Run very fast. Melodie Scott can be particularly scary. I tried to interview her at her home and was threatened with arrest for just knocking on the door and asking for an interview. Her son Chris chased me down the street threatening me with arrest for simply asking to speak with her. She had reportedly also threatened Janet with arrest on apparently trumped up charges as well. Why would she be afraid of an interview? Well, when Janet’s mother Amalie was alive, Melodie reportedly withheld heart medication. Fortunately for Amalie, Janet rushed the mother to the hospital and saved her life. Unfortunately for Amalie, Melodie Scott reacted to Janet’s life-saving results by getting a restraining order to keep Janet from doing it again. Since when do conservators have the right to stop family members from saving a ward’s life? Oh, maybe it has something to do with dwindling trust funds. And surprise, surprise, while under Melodie’s care, the mother wound up dead. There should be lots of questions there. What needs to be grasped out of this is that the whole Public Guardian system is corrupt. It’s not just corrupt in Orange, Riverside and San Bernardino Counties, but throughout the State of California. Whenever you have a non-family member taking charge of the funds of an individual, you have a system where corruption is at a high point. There have been lots of reports of judges being paid off in the system and of people being helpless to fight an overpowering and corrupt system that is out of control. A lot of money is flowing and changing hands in these conservatorships. At least, if a person blows their own money, they have nobody except themselves to blame. But what gives a public official or a court-appointed official the right to deplete the funds of someone who doesn’t want them to control their funds? America was built on self-determination. Seniors and others need protection from the very people who claim to be protecting them. It’s time to re-examine the whole process of conservatorships. The Public can do without Public Guardians and conservators grabbing their assets and leaving them to die in squalor. The state can do without the waste of funds going to various Public Guardians offices that terrorize the elderly without doing anything to protect their real interests. This isn’t somebody else’s problem. One day, if you earn enough money, the Public Guardian or a conservator could be after you. Is this the future you want for yourself? Ruth Hull is an activist and writer whose career has included work as a criminal defense attorney, a licensed private investigator, and an educator. From Ken and Kathie, some good questions on where is Mary? Subject: Re: Sylvia and Elaine–ok to publish? okay to publish? and I will include your comments that all AS cared about was Mary and arts and crafts and the “sign in sheet” he sidesteps the need for Mary to see Gloria and her old friends and neighbors, including me. He also fails to acknowledge to the court that CT engaged in some serious abuse, telling Mary she would “NEVER!” see he beloved Gloria again, she grabbed her arm and tried to march her down the hall so hard, Mary cried out in pain. She had been screaming and hollering for Gloria to leave, etc. The staff did nothing. I believe they were quite shocked at how furious CT was and had not seen that before. I always saw Mary walking around the neighborhood and said “hi” to her. She would walk by my house and the park frequently. We all knew her. She would sweep up leaves in the street gutters and the side walk in front of her house. Btw, when the nice police lady said that sometimes she did “wellness” checks on Mary, I thanked her and told her she probably saved Mary’s life. Based upon other cases that I’ve examined, It is my opinion that the move to the nursing home for Mary was the signal that the miscreants have determined that Mary is too dangerous to keep alive. I felt this in the Jaycox case, and observed that he ‘fell out of bed’ hit is head. Then he broke his hip. This was followed by aspirated pneumonia. AS waxing eloquent over how Mary was enjoying arts and crafts is a clear cover for her removal to a nursing. home. Since day three when the ‘gold coins’ were secured and it appeared that there would be a full court press to thwart any effort to require CT to inventory the contents of the safety deposit box I have been concerned that there might be an acceleration of Mary’s date of death. (See Farenga letter to the IARDC and the two IARDC complaints filed against JoAnne and yours truly) I and others who wanted justice for Mary therefore hounded the Naperville Police to do wellness checks. Every wellness check made the miscreants Paranoid. Kammerer is a honest cop! I believe that he and a few of his officers harbored suspicions as to the scenario and in subtle manner gave AS, CT, CF, PS the impression that if they could prove misconduct AS, CT, CF, PS would receive equal protection of the law on a level playing field. Thus, as Mary is now a liability – it appears from Gloria’s description that she still has her wits about her and is still a survivor. Thus, if Mary’s demise is to be enhanced CT, AS, CF, PS must have cover. If Mary should have a fall – Kammerer might order an investigation – everyone has watch the crime shows and watches DNA being removed from a speck of dust. Thus, placing her in a nursing home where falls are common, and it is not uncommon for a person to die in his/her sleep, fall out of bed, break a hip, or even aspirate food. Thus, a quick cremation and all the allegations are speculation. The nursing home scenario falls apart if Gloria or a neighbor, a relative, or a friend visits every day. The induced depression lessens and Mary’s cries to go home would no longer fall upon deaf ears! Thus, the full court press to prevent Gloria and family members from visiting. Adam Stern – who is reported to have disclosed a pecuniary interest in the “cottage industry” – apparently felt that he had to justify the incarceration of Mary in the nursing home – ergo, his telling the Court all about how wonderful it is in the nursing home. But for the Gloria visiting her mother and giving home the ‘final solution’ was mapped out! Now Mary’s final reward has to be delayed. Thus, Judge Stuart, issued orders that while appearing to provide visitation actually restore the isolation of Mary Sykes. The Illinois Legislature tried to avoid this scenario. Take a look at the Gore case – Bev Cooper will tell you all the details as to how allegedly Miriam Solo orchestrated the separation of her mother from a 1.5 million dollar estate etc. This is a cottage industry that *****. Our next step is to file as quickly as possible the Petition for a Supervisory order in the Supreme Court. By keeping the pressure on the miscreants cannot activate their ‘final solution’ for Mary. As it is abundantly clear that the Circuit Court had no jurisdiction the legal apparatus gives no cover to the miscreants and no matter how much clout they have or who is their clout – juries are going to decide their fate! I’m must be dense, I don’t get the arts & crafts, unless he’s trying to imply that Aunt is only capable of ‘basket weaving’, or the like. Am I on the right track?